When I was first starting out in IT I had a senior colleague who commented to me about all the throw away knowledge she’d collected and tossed over the years. She talked about learning early versions of VB, an obscure OS for an old HP minicomputer, the aging phone system we had, and all kinds of other things she’d learned in her career that was, or was about to become, useless knowledge. Liz taught me a lot of things, but that basic observation about spending lots of time acquiring information that promptly becomes useless stands out in my mind as a useful caution. It has also become something I’ve try to plan around and compensate for as I advance. For example I almost never bother to memorize an API: I can generally keep the documentation handy which is often updated when new features are added where my memory would lag behind. It’s also part of why I love puzzles: they keep my brain in practice at gaining and tossing aside detailed information. There is just about nothing as useless as the things you teach yourself while doing a jigsaw puzzle. The small details that allow you to associate pieces with parts of the puzzle. 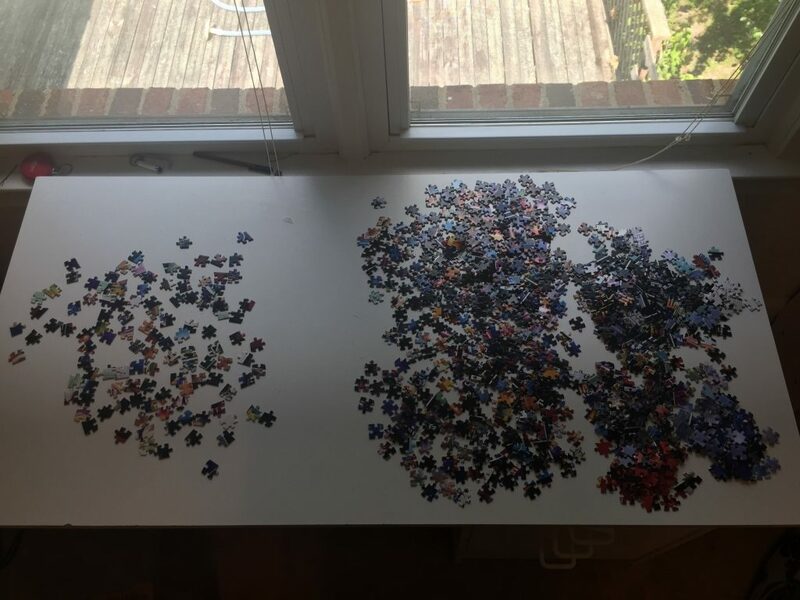 The ways you sort pieces for a particular puzzle. 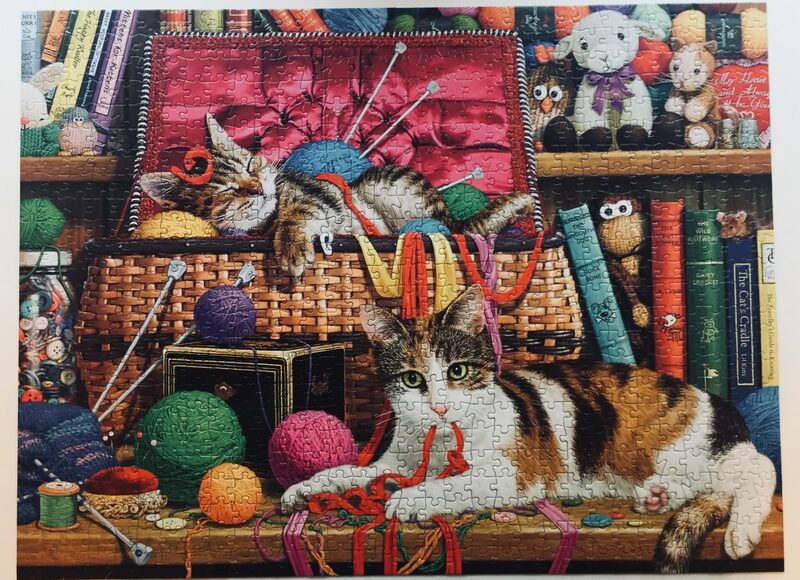 All kinds of things that really only apply to the puzzle you’re doing and not any other. The start of the cat puzzle at the top of this post as it got started. Stacks of red, white, brown, and green pieces are gathered on lower right while I finished the boarder. The wood grain and basket weave would be sorted during later passes. There are plenty of studies that show we need to keep our brains active doing different things to help keep them healthy – some even look at the value of puzzles. Programming, and other tech work, certainly does that by default, but as any of us works with a specific platform we get used to the patterns it uses and therefore slow our rate of learning. Puzzles also are good for finding practical applications for basic computer science concepts. Sorting in particular is something that puzzles encourage different approaches not all of which are routinely needed in development work but are good to remember are out there. The concepts of the core of radix sorts – or bucket sort – are extremely useful, and can even be used as a form of compression for a puzzle. 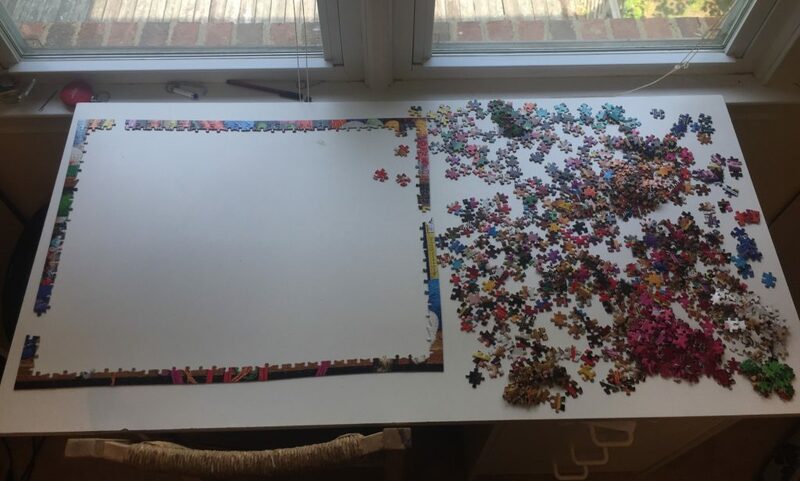 My puzzle desk is a bit too small to allow me to spread out all the pieces of most incomplete puzzles, but digging through all the pieces over and over is just a waste of time. So I often find a basic pattern I can do quick sorts by, and stack up pieces by color, or those with book covers, or other other easy to quantify detail. Then as I move through assembling the puzzle I can grab a stack of those pieces and do another round of sorting and assembly. Like a radix sort, you don’t need to first pass to be useful to make progress on the overall solution. The next puzzle getting started with edges sorted on the left and rough collections forming on the right. That big collection on the right is text and poster edges (puzzle is a collection of classic Star Wars posters). Liz was right. I too learned and dropped VB; that stupidly designed phone system was mine until we replaced it with one slightly less stupidly designed; Drupal 4, 5, and 6 all had particularities I recall only to be nostalgic about the past; and the things I’m teaching myself these days about Salesforce will one day be equally useless. That’s okay, it’s what I signed up for, and if you are finding your own way in this field it’s a reality you should plan on being a part of the rest of your career.